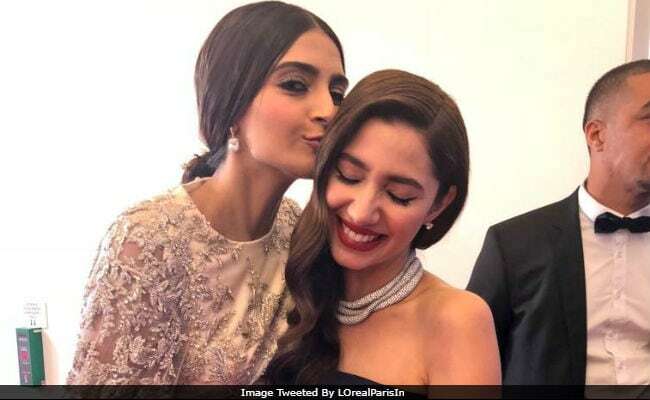 Cannes 2018: This Pic Of Sonam Kapoor And Mahira Khan Is Viral. Seen Yet? Sonam Kapoor and Pakistani actress Mahira Khan walked the red carpet for cosmetic giant L'Oreal on Monday night. Both the actresses were looked radiant on the red carpet but the main highlight from the starry night was a picture of Sonam and Mahira sharing a warm hug. The picture, which is now viral, was shared by L'Oreal Paris India's Twitter account. Sonam and Mahira represented the brand from their respective countries. Newlywed Sonam Kapoor walked the Cannes red carpet in an off-white embellished lehenga from the studios of Ralph and Russo. She looked radiant. While Mahira, who debuted on the Cannes red carpet, pulled off a black off-shoulder dress. Take a look at Sonam Kapoor and Mahira Khan's viral picture here. Ahead of making an appearance in Cannes, Sonam had tweeted about meeting Mahira at the French Riviera. Mahira had congratulated Sonam Kapoor for her wedding and the Raanjhanaa actress replied: "Thanks so much, Mahira! Can't wait to hang out with you at Cannes!" Read Sonam and Mahira's Twitter exchange here. Now, take a look at Sonam Kapoor's spectacular red carpet entry last night. She her hair loosely tied in a braid and accessorised it with a paranda. Mahira walked on the red carpet looking like this. She wore a stunning gown by Nicolas Jebran for a party after the red carpet. Sonam Kapoor is attending the Cannes film festival for the eighth year this time. She will also walk the red carpet tonight and with that, she will wrap up her Cannes duties for this year.